This is a guest article by Daniel Nugent. Where Melbourne’s ever-expanding western suburbs sit today, vast native grasslands full of wildflowers once stretched over sweeping plains. These colourful grasslands continued beyond the Melbourne region, extending west along Victoria’s volcanic plains to Hamilton in western Victoria. Prior to European settlement, Melbourne’s grasslands supported a spectacular array of wildlife, the likes of which would have rivalled other awe-inspiring grassland biomes around the world - such as the savannahs of Africa, home to elephants and zebras, or the prairies of North America, home to bison and prairie dogs. Large mobs of eastern grey kangaroos and emus once foraged Melbourne’s grassy landscape, and small marsupials such as bandicoots scampered between grass tussocks, digging small holes along the way in search of food. Sadly, many of the species that once called Melbourne’s grasslands home are now rare or extinct, following a long history of grassland destruction from agriculture and urban expansion. Add to the mix introduced predators and competitors and you have an ecosystem on the edge of collapse. The eastern barred bandicoot, eastern quoll and the grassland earless dragon are just a few species that have been lost from the Melbourne region. Added to this list is another notable species - the plains-wanderer. 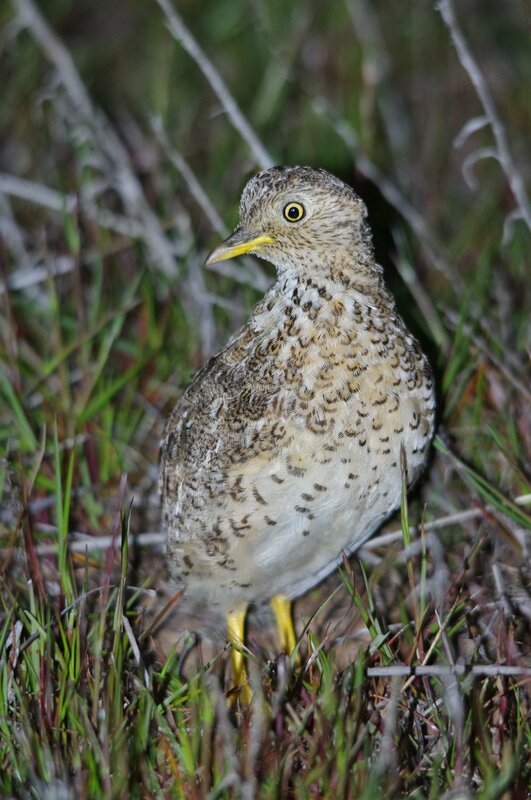 A small, elusive, ground-dwelling bird, the plains-wanderer is a special but rarely seen inhabitant of eastern Australia’s grasslands. Within grasslands they are often mistaken for quail, but the plains-wanderer is actually more closely related to inland shorebirds, like plovers, and is the only member of its family Pedionomidae – a distinctive and ancient lineage of Australian birds. A species found only in Australia, experts believe there are less than 1,000 individuals left today. Owing to its evolutionary distinctiveness and risk of extinction, researchers recently ranked the plains-wanderer as the most important Australian bird, and fourth most important bird in the world, in terms of conservation. Perhaps owing to its ancient lineage, the plains-wanderer possesses a unique and quirky set of physical and behavioural traits. For instance, unlike many other species, adult females are much larger than males, and it is the female who is more colourful, with a black neck-collar with white spots and a rufous breast plate. The female also defends a territory and calls to attract males. After laying eggs, the female leaves the male to incubate and raise the chicks on his own. Further adding to their uniqueness, the plains-wanderer has a very deep voice for a bird of its size. Females make a low frequency “oom” call when trying to attract mates which can be heard from several hundred metres away. To locate where other birds are calling from, all plains-wanderers have a large hole through the centre of their head which allows sound to arrive at each eardrum twice, thus acting like a directional microphone. This method of hearing works very well for picking up deep-sounding noises, but it is suspected that plains-wanderers cannot hear high frequency noises like the bleating of sheep or the tweeting of other birds. This remarkable little bird was once found in native grasslands across eastern Australia, ranging from Victoria, through South Australia and New South Wales, all the way north to Queensland. Today, however, only two areas support strong populations of plains-wanderers: one is on the natural grasslands of the Murray Valley Plains, west of Echuca, in Victoria; the other is on the semi-natural grasslands of the New South Wales Riverina, north of Deniliquin. The primary driver of their disappearance from this former range is habitat loss. Only around 1% of native grasslands remain in Victoria and, disturbingly, large areas continue to be destroyed to this day. While intensive agricultural practices have caused the loss of the majority of grasslands in Victoria, not all farming practices appear to be incompatible with plains-wanderers. A number of conservative livestock grazing properties in northern Victoria have supported important habitat for this species for many decades. These properties show that with sustainable management, plains-wanderers can be supported in agricultural landscapes. However, there is no home for the plains-wanderer in the new housing and industrial developments on the plains west of Melbourne. In the early 1900s, plains-wanderers were frequently sighted in this area, but observations dwindled over time. There have been a handful of plains-wanderer sightings over the past few years, including a number of interesting and somewhat bizarre encounters in the western suburbs. For example, an adult female was captured at a Melton shopping centre in 2011 (this bird was taken to Melbourne Zoo and later released). In 2013, a male bird was seen by a CFA member whilst fighting a grass fire in Little River. These observations suggest that plains-wanderers may still be persisting in Melbourne’s Western Plains, but at very low numbers. Unfortunately, it is only going to get harder for plains-wanderers to find suitable habitat as this landscape becomes increasingly modified and fragmented. However, there is hope on the horizon. Melbourne’s western grasslands could be saved from further destruction by a proposal to create two new, large grassland reserves, together called the Western Grassland Reserves. The Western Grassland Reserves will protect 15,000 hectares of critically endangered native grassland near the outer western suburb of Werribee. This reserve system is being established to offset the loss of native grassland from new housing and industrial developments on Melbourne’s fringe. The acquisition of land for the reserve is underway but is far from completion, with only around 12% currently acquired and being managed. The Western Grassland Reserves represent a fantastic opportunity to support the recovery of the plains-wanderer and other grassland species. However, we won’t see the full effects until the reserve system is protected in its entirety. It’s exciting to think that if this reserve is protected and managed appropriately, we may again see this globally significant species wandering the grassy plains at Melbourne’s doorstep. Daniel Nugent is currently undertaking a PhD at La Trobe University investigating the importance of food availability for the plains-wanderer and other grassland birds in Victoria’s Northern Plains Grasslands.